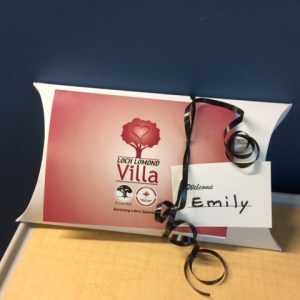 Every year Loch Lomond Villa submits a ‘wish list’ to Loch Lomond Villa Foundation for additional funding over and above their annual operations budget from the provincial government. These funds are used towards funding programing, purchasing new equipment and supplies. The Foundation Board of Directors has approved more than $70,000 in funding for Loch Lomond Villa this this fiscal year. One item on this year’s list was requested on behalf of the Planetree Steering Committee who had a wonderful idea to create Welcome Packages for new nursing home residents upon admission and Comfort Baskets for the 5 family suites. We hope that by supporting this Planetree initiative our residents and families will feel more welcomed when coming to our home. Planetree is Loch Lomond Villas person-centred care approach. This means providing individualized care for all residents and applying the highest standards of care to everything we do. We are focus on the elements of care and support that matter most to residents and their families. The Welcome Packages are given to each new resident upon admission and includes a personalized card welcoming them to their new home; personal hygiene items; games, books; and more. When residents come to Loch Lomond Villa from hospital or home sometimes it’s the basic items that they are missing that can help make their transition a little smoother and make them feel more welcome. The Comfort Baskets for the family suites include personal hygiene items, door knockers, Kleenex and more. The family suites in our home are comfortable, private rooms available to families of residents to utilize. They are each equipped with their own washrooms/showers, pull out beds, small kitchenettes. When a loved one is sick or palliative this provides a space families can use to stay close to their loved ones. 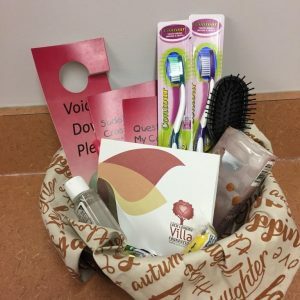 Normally staying in these suites is a last minute decision and you may not have all the items you need with you, so we hope these comfort baskets provide comfort when it is needed most.